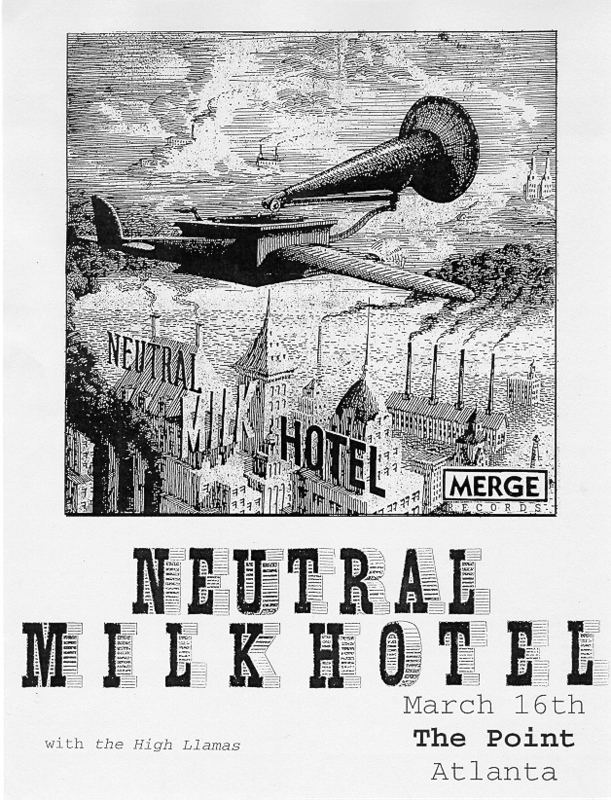 Memorabilia from past Neutral Milk Hotel shows (and other closely related bands), including posters, flyers, setlists, ticket stubs, and whatnot. Synthetic Flying Machine flyer, early 90s. Ruston, LA. 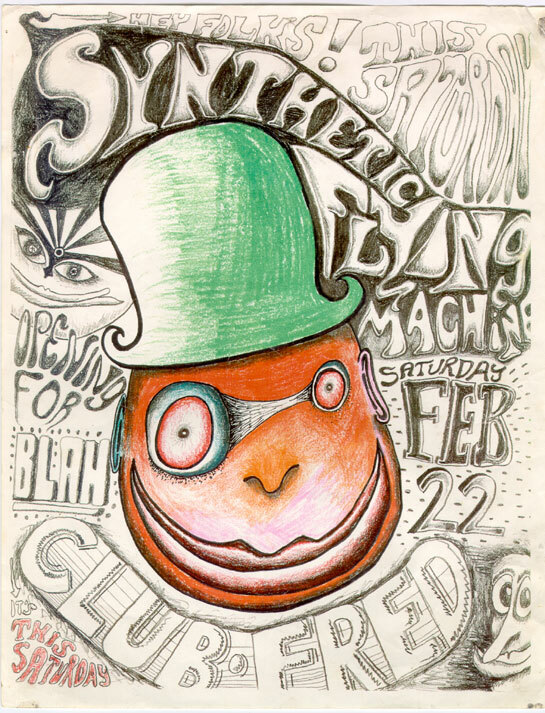 Synthetic Flying Machine poster, 2/22/92. By Will Hart. 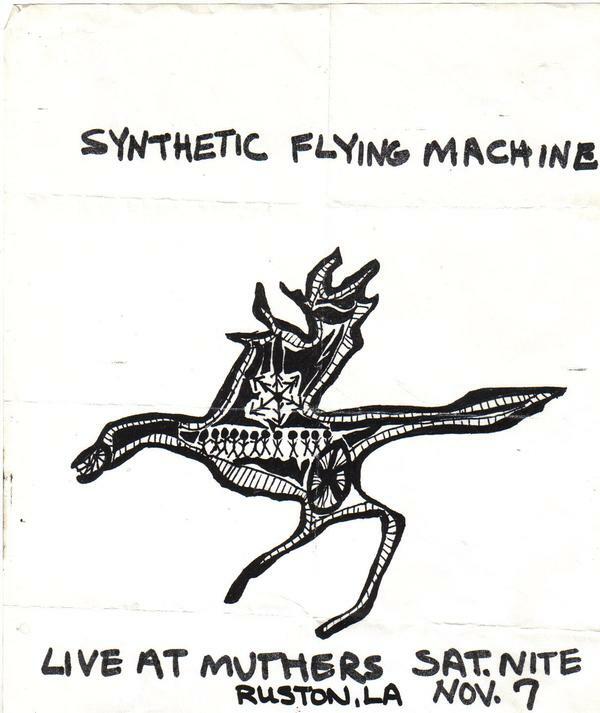 Synthetic Flying Machine poster, 3/12/92. By Will Hart. 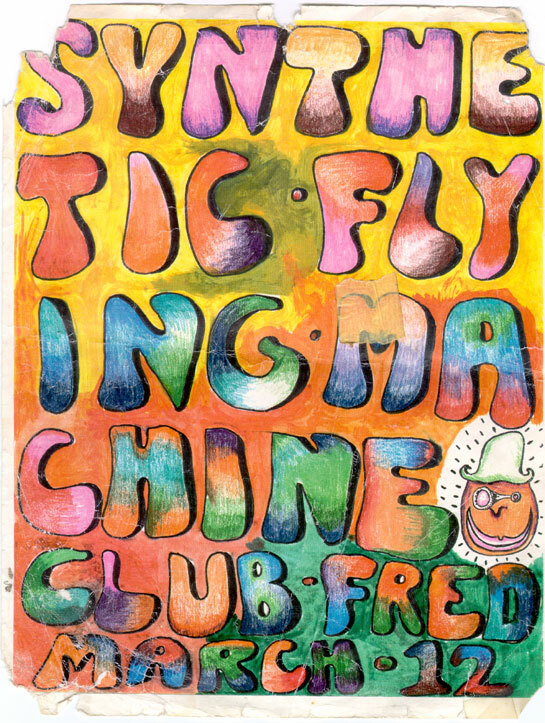 Synthetic Flying Machine poster, 4/18/92 . By Will Hart. 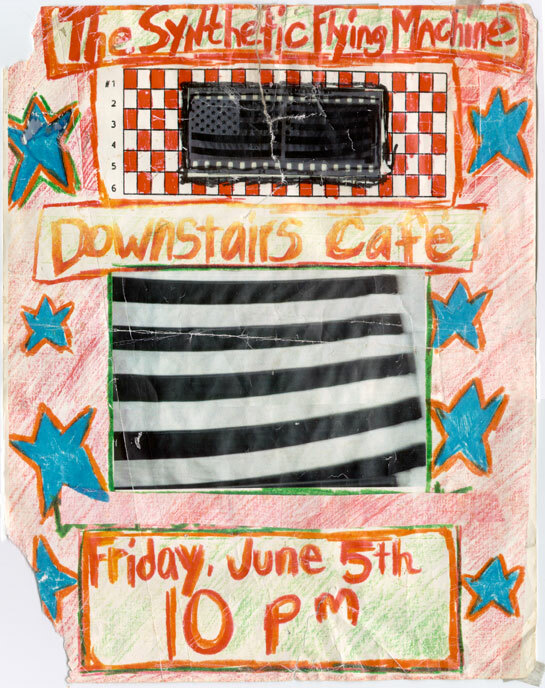 Synthetic Flying Machine poster, 6/5/92. likely by Jeff Mangum. 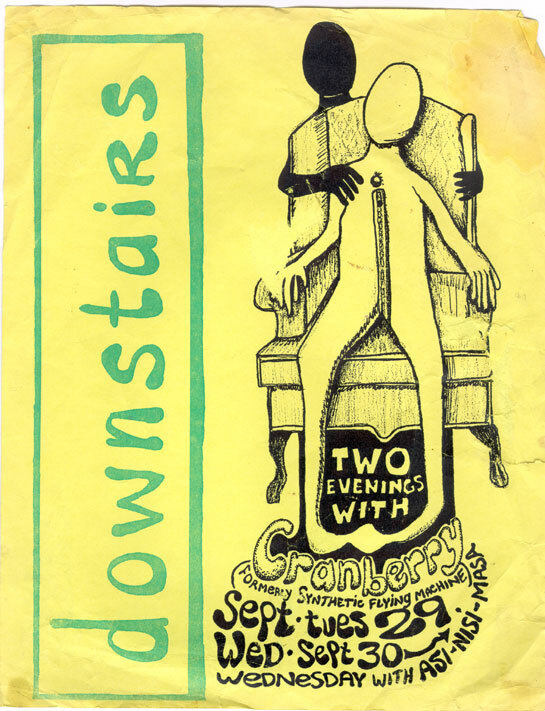 apparently Synthetic Flying Machine (formerly Cranberry Lifecycle) changed their name to Cranberry for at least these couple shows. 9/29/91 & 9/30/92. 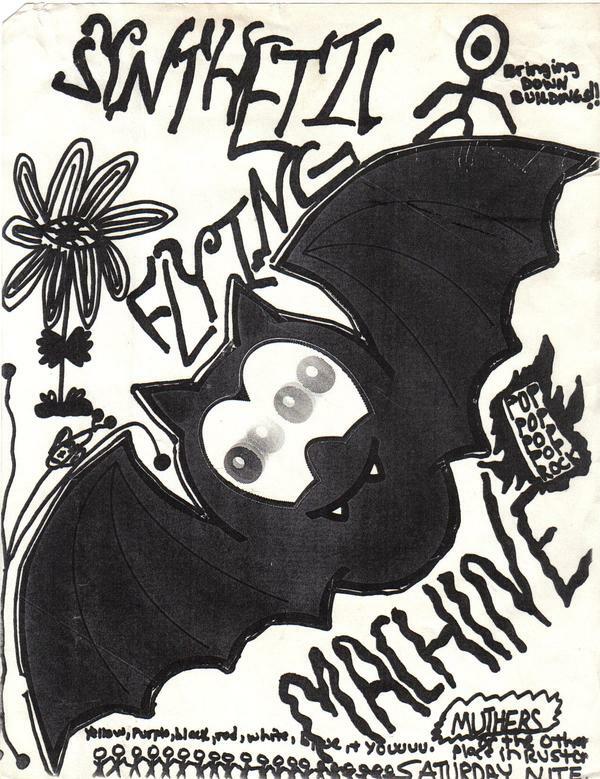 Synthetic Flying Machine flyer, 11/7/92. By Paige Dearman. 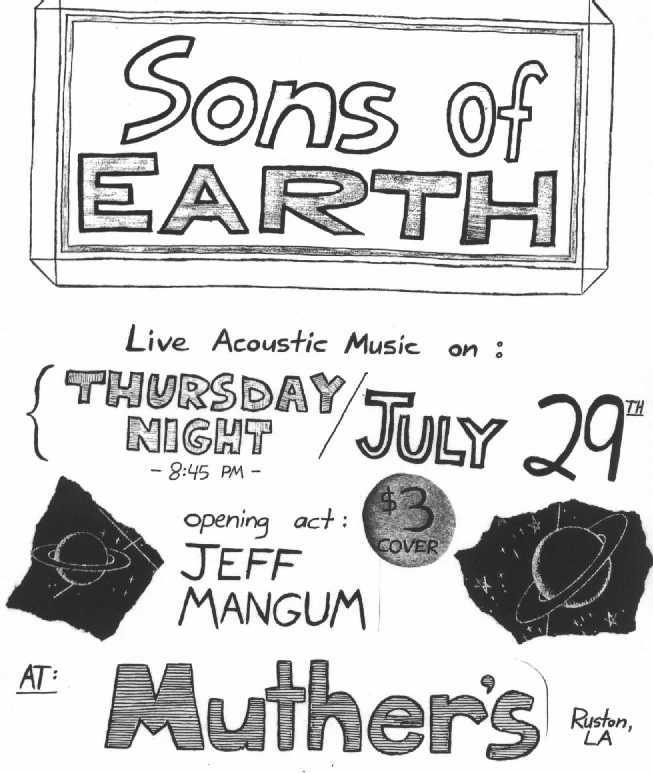 Jeff Mangum with Sons of the Earth flyer, 7/29/93. By Ross Beach, who says, "I think this started out as a doodle, actually." 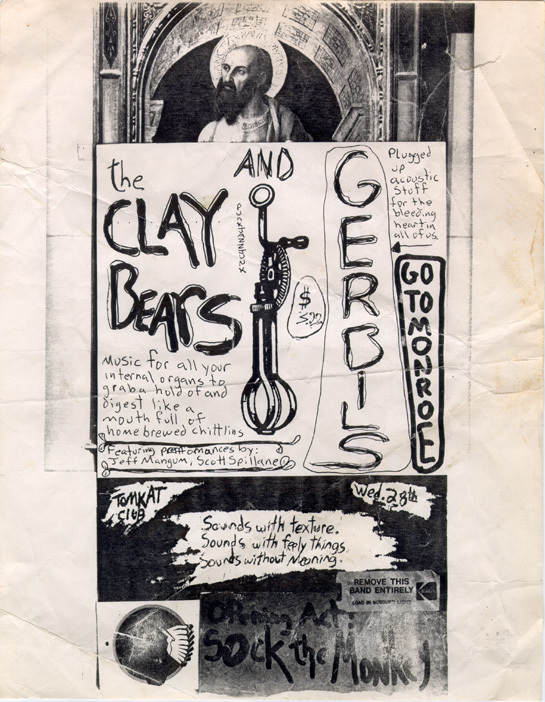 The Clay Bears and The Gerbils flyer, circa '94. "Will Westbrook might have been responsible for this one, but I'm not sure," says Ross Beach. 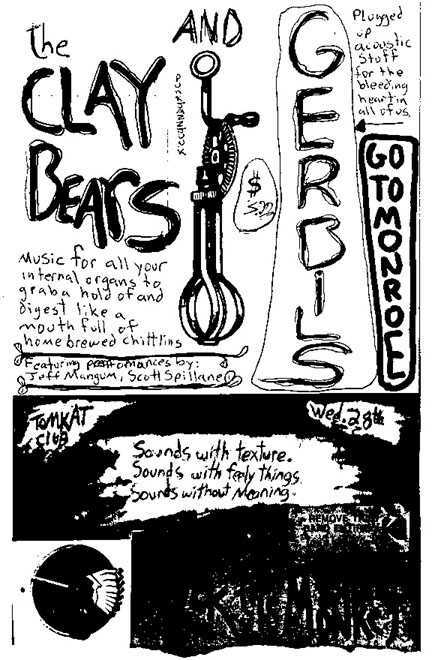 Alt version of same Clay Bears/Gerbils flyer. Says Ross, "The show ended with one keyboard chord played for 15 minutes amid random noises." NMH with Sons of the Earth and Scott Spillane, 3/17/94. Flyer by Michel Boulware. Cover star: Katie Smith. The show's turnout was about 25 people. 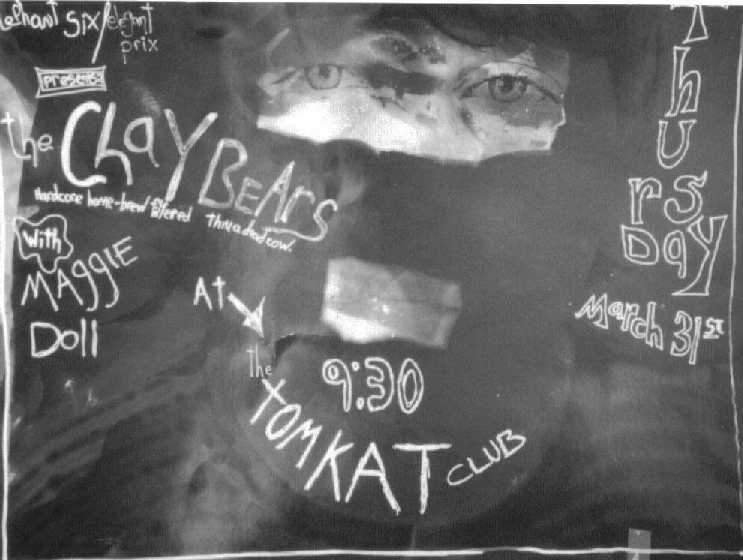 Clay Bears, 3/31/94. This is a Will Westbrook photo of Will Hart. Westbrook scratched the show info into the print while it was still being developed. 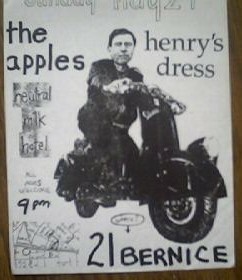 Neutral Milk Hotel, The Apples, and Henry's Dress flyer, 5/21/95. 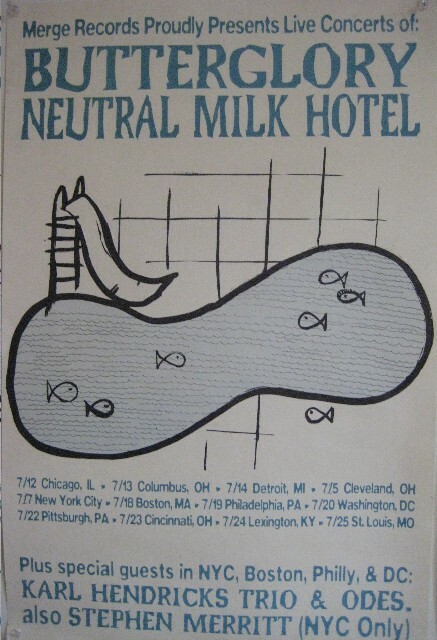 Poster for July 1997 Neutral Milk Hotel tour with Butterglory. 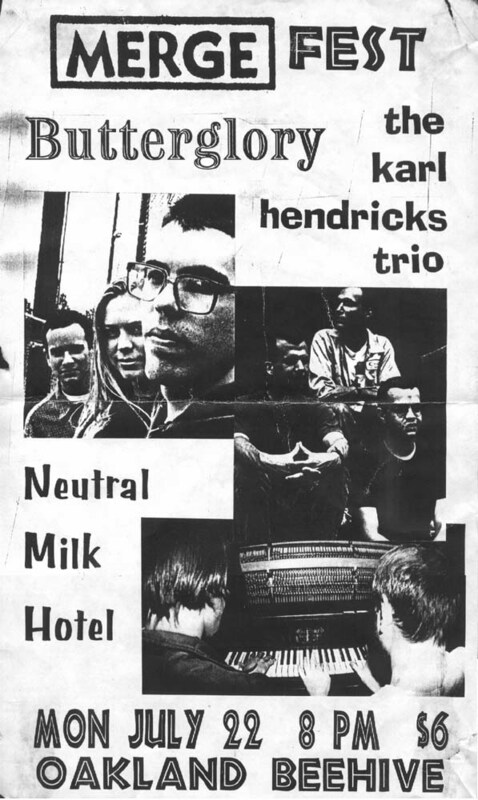 NMH w/ Butterglory and the Karl Hendricks Trio flyer for a show at the Oakland Beehive, 7/22/96. photocopy of NMH setlist from 9/6/96 Mergefest in NYC. Julian's writing. 3/27/97 poster. NMH with Elf Power and Of Montreal. Terrastock pass, Rhode Island, April 1997. 8/30/97 flyer. 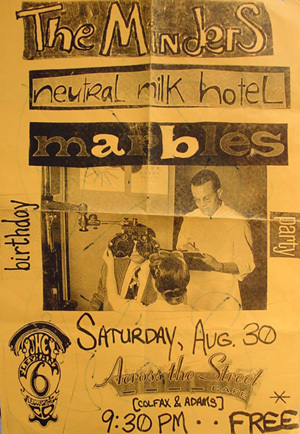 The Minders, Neutral Milk Hotel, and Marbles. 11/22/97 poster. 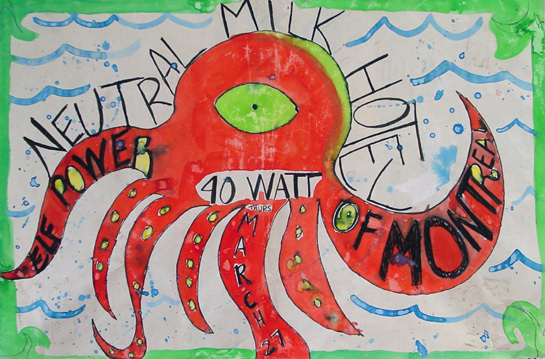 Apples In Stereo with Neutral Milk Hotel and OTC. 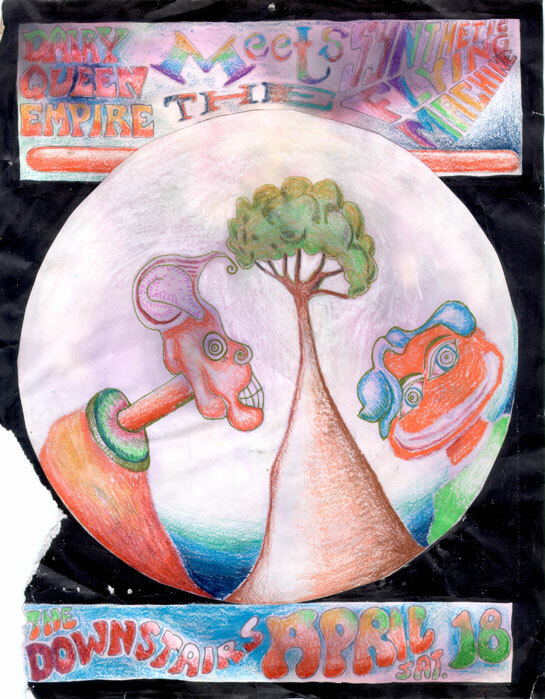 2/4/98 poster. 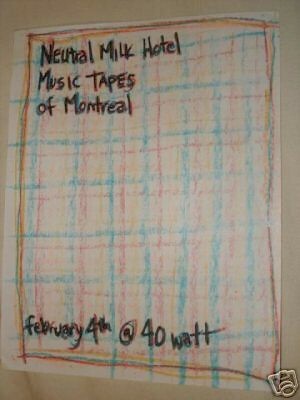 Neutral Milk Hotel with the Music Tapes and Of Montreal. 3/16/98 flyer. 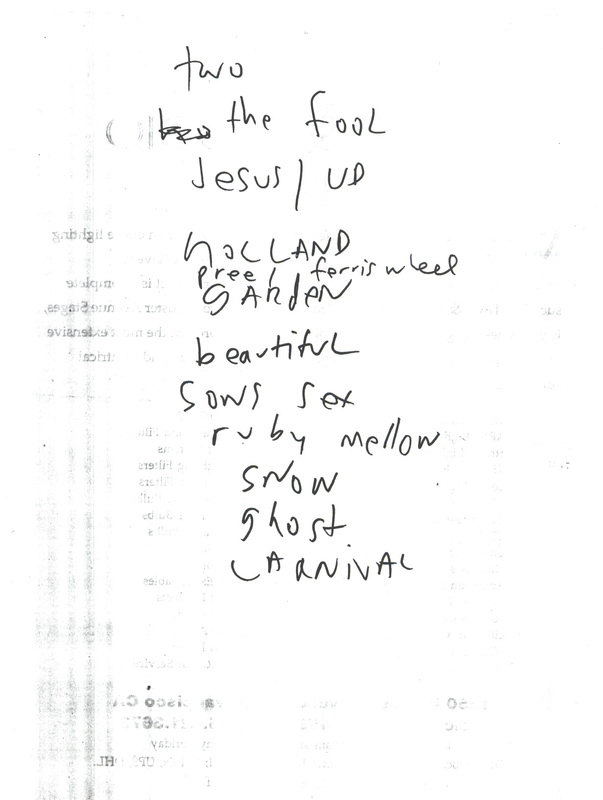 The Point, Atlanta, GA.
photo of setlist for 4/15/98 Portland show. Jeff's writing. Not sure what that last song is. 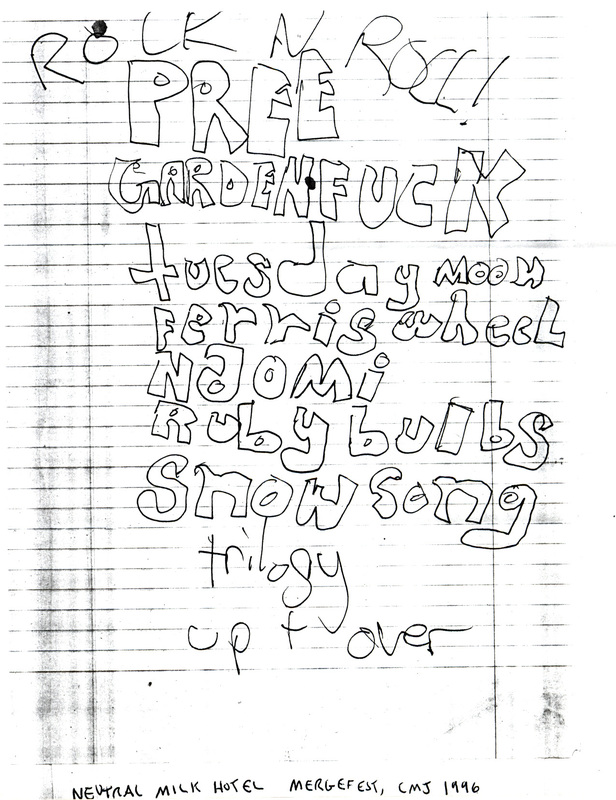 photocopy of setlist for 4/18/98 Terrastock II, San Francisco. Jeff's writing. 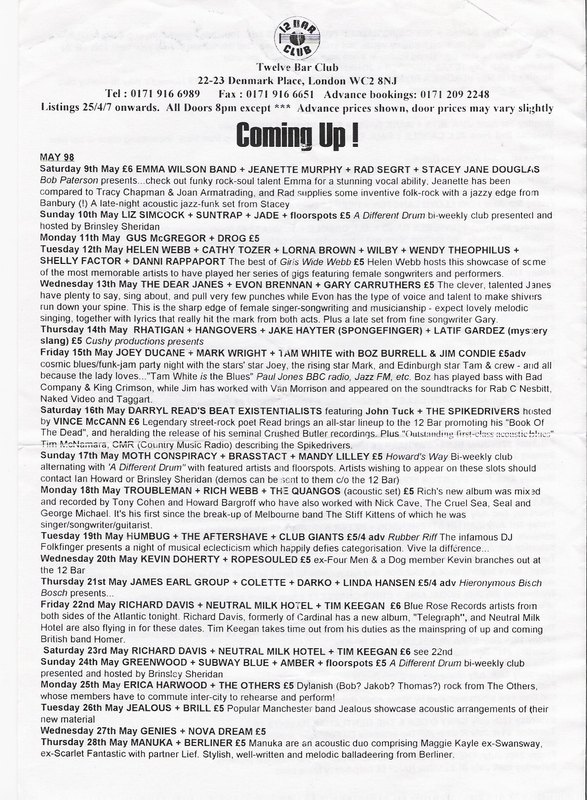 12 Bar Club schedule mentioning 5/23/98 NMH show. Thanks to Alex Briggs for this. 6/12/98 poster. By Jill Carnes, I'm pretty sure. 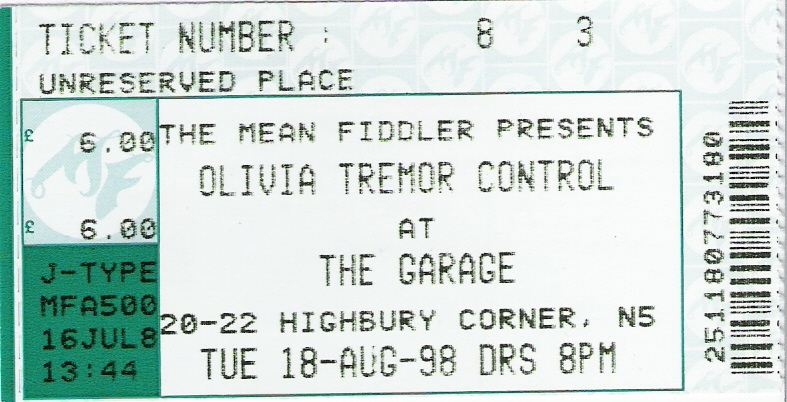 ticket stub for 8/18/98 Garage, London show. 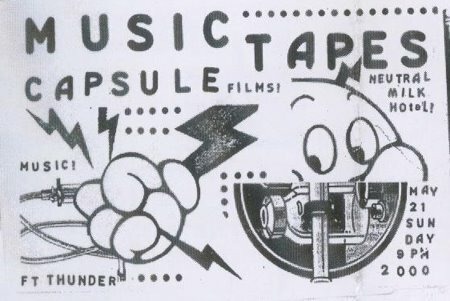 Olivia Tremor Control, Neutral Milk Hotel, and the Music Tapes. Thanks to Alex Briggs. 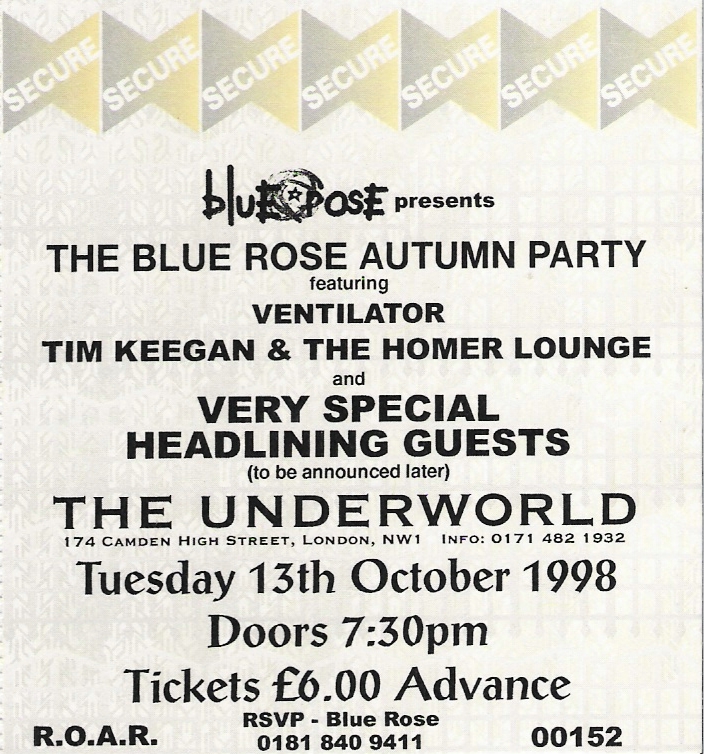 flyer for 10/13/98 Underworld, London show. (NMH was the "very special headlining guest".) Thanks to Alex Briggs. 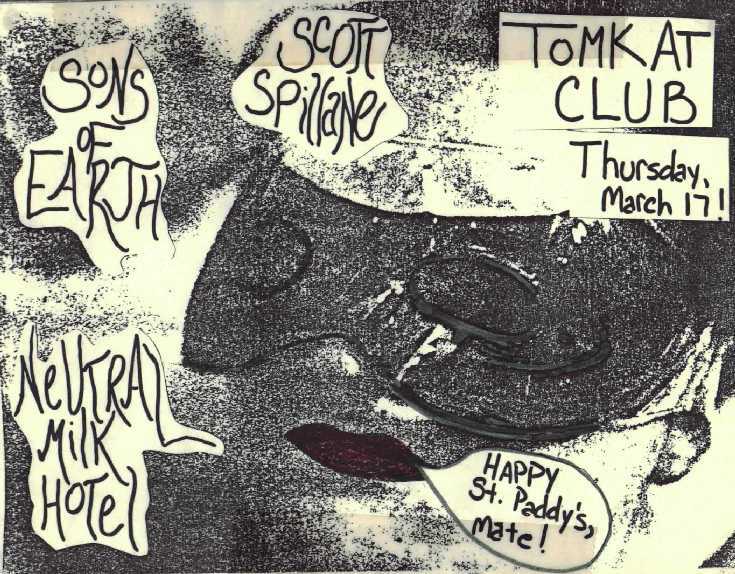 poster for Walking Wall of Beards, Inc show (mistakenly billed as World of Wild Beards, Inc), 2/4/01 New Zealand. By Chris Knox, I think. Laura Carter's setlist for 2/4/01 show. The first 2 songs ("Rain" [Beatles?] & "Nothing's Going to Happen" [Tall Dwarfs]) were likely with Chris Knox. 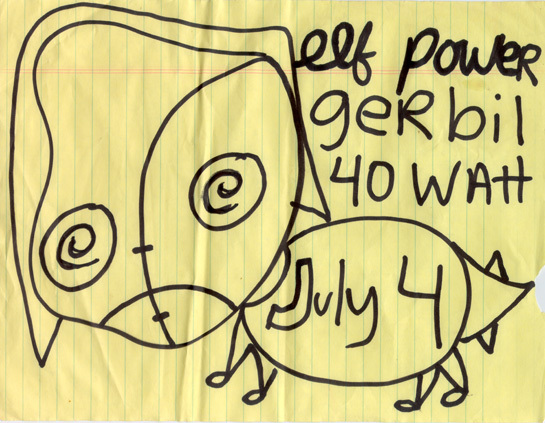 Elf Power flyer, 7/4/02. By Jeff Mangum. » releases, t-shirts, posters, etc. » NMH-inspired fan art, tattoos, etc.